April 2014, I made the decision to go natural because I got tired of my hair and truthfully I wanted a change in my look. Now, I didn't want to be drastic about my decision and was a nervous about a big chop, so I decided to transition (adding no relaxing creme to my hair and letting my natural hair grow out, then I trim off the relaxed part when I feel the natural hair has grown to my desired length). I transitioned for about 9 months then I cut of the relaxed bits. Since the I have been a NATURALISTA.... LOL!!! 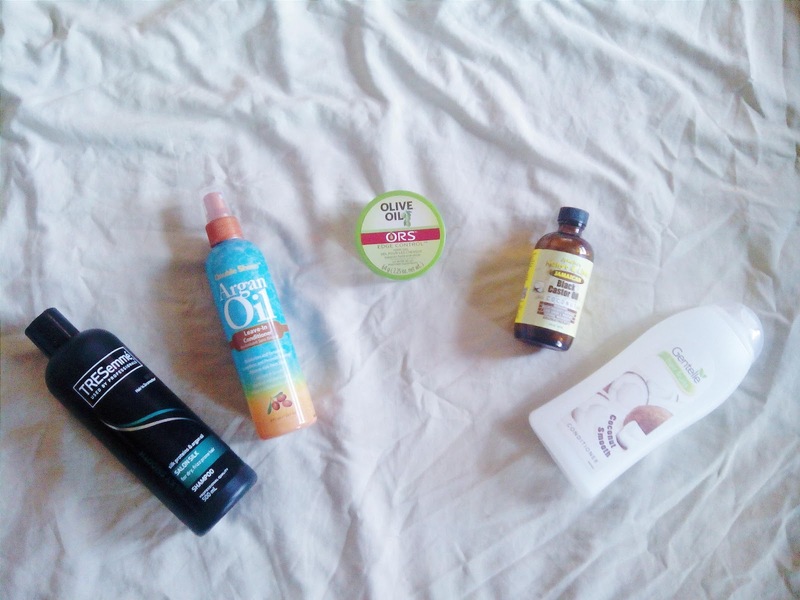 I have used a couple of products on my hair but I decided to let you in on my favorites at the moment. First, is the Jamaican black castor oil with coconut which has helped thicken my hair and makes my hair smell so good. I recently bought Tresemme salon silk shampoo for dry, frizz prone hair which I use when I want to clarify my hair ( to remove excess product build up), it leaves my hair so soft even before I condition it. Double sheen argan oil leave-in conditioner helps retain the softness and style of my hair and it's easy to apply, just spray it. Last but definitely not least is the Olive oil ORS edge control hair gel which helps to keep my edges in place for at least 12 hours. There you have it the 5 hair products I have been loving lately. What are your favorite hair products?